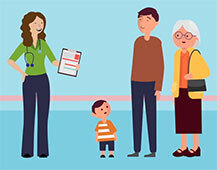 The Berkshire West integrated care system includes Berkshire West Clinical Commissioning Group (CCG), the acute Royal Berkshire Hospital and Berkshire Healthcare foundation trusts, and providers of GP services in four locality or neighbourhood ‘alliances’. The system covers a registered population of approximately 528,000 residents in Reading, West Berkshire and Wokingham. Through what is known as the Berkshire West 10 Integration Programme, the system works closely with South Central Ambulance Service Foundation Trust and the three local authorities in the area: West Berkshire Council, Wokingham Borough Council and Reading Borough Council. The local government chairman of this parallel programme has a seat on the integrated care system leadership group to ensure the two programmes are mutually supportive. The integrated care system is based on voluntary collaboration founded on the principle of reaching joint consensus. The CCG governing body and the foundation trust boards remain the statutory decision-making bodies. An integrated care system unified executive group, including all partner organisations, has responsibility for delivering the programme of work and for monitoring and reviewing the financial performance of the integrated care system and its constituent organisations. The Berkshire West NHS organisations perform well against a set of national benchmarks including non-elective admission rates and are leading on innovative approaches to improving clinical care and patient experience in areas such as diabetes, stroke, and improving access to psychological therapies. Despite this, the local health and care system is facing a number of significant challenges including a growing elderly population, increasing demand for services, the development of new treatments and issues with staff recruitment and retention. The partners aim to create a new environment of collaboration between health and social care organisations to improve services for the local population. They want to ensure that the population’s health and experience of healthcare services continues to improve. Make faster progress in transforming the way care is delivered, as set out in the NHS Five Year Forward View, in particular making tangible progress in urgent and emergency care reform, strengthening general practice and improving mental health and cancer services. Manage improvements within a shared financial control total and deliver the system-wide efficiencies necessary to manage the local NHS budget. Operate as an integrated health system, keeping people healthier for longer and reducing avoidable demand for healthcare services. Staff and workplace wellbeing is improved, and a sustainable and highly skilled health and care workforce is built in Berkshire West. Watch a video about the service with comments from patients and health professionals.